The Grey Knights are now out and about – let’s talk about the Relics of Titan! The Grey Knights have access to some of the deadliest wargear the Imperium can muster so you would expect their relics to be pretty awesome. Well we’re taking a look at each one and ranking them based on what they can do on the tabletop. Keep in mind we’re not taking into account any other synergies in the army – we’re only ranking them against each other with no other considerations. We’re putting this one at #6 because it’s highly situational. You’ve got to be playing against an army with Keyword Daemon around (which might be more common than you think). But then you’ve got to get within 6” of those daemon units for this to kick in. However, if you can manage it and force a leadership test (via wounds or other means) you just might get an extra daemon to run for the hills. 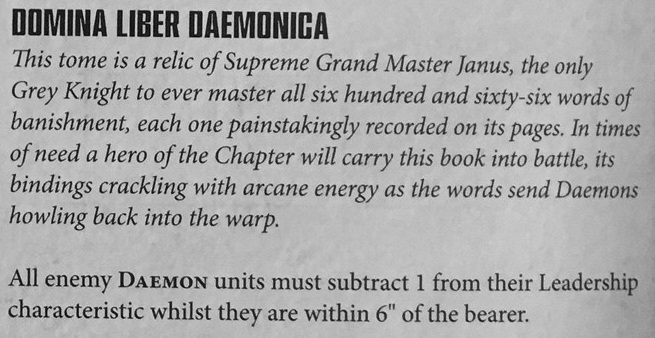 Not too bad if you know you’re playing against daemons to begin with – but other than that, kind of “meh” in our book. 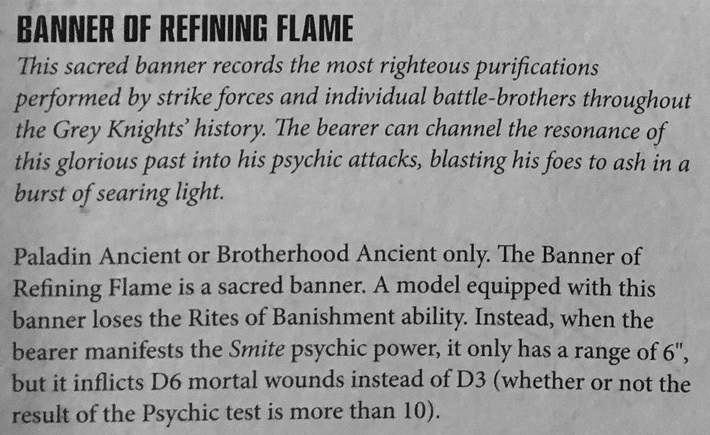 The Banner of Refining Flame can be super effective – if you can get close enough to use it. Dropping your Smite range to 6” but upping the damage to D6 mortal wounds sounds like a good trade…but I’m not sold. Why? 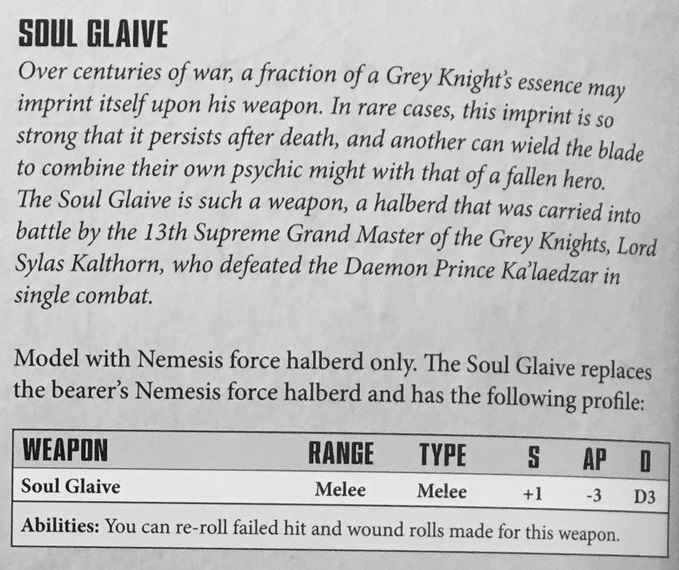 Well, it can only go on Paladin Ancients or Brotherhood Ancients (Banner Bearers) which means these solo models are just that – solo models. Sure, you can protect them with good bubble wrap, but when you’ve got to get close to use this ability…well, it just seems counter intuitive. Oh, and there is always the possibility that you roll a 1 anyways… I like that it still counts as a Sacred Banner (so you get bonus attacks and leadership still) so that’s a plus. I guess if your battle plan revolves around using it ”in addition too” vs “building around it” then it’s worth taking. Most character that can take this already have at least a 5++ invulnerable save (or ways to get one). 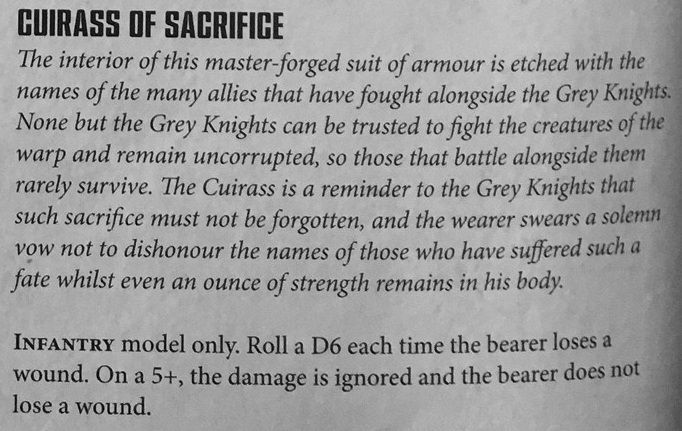 But that’s not what the Cuirass of Sacrifice is – it’s the new and improved “Feel No Pain” bonus saving throw. Remember that this triggers each time a this model “loses a wound” – that includes Mortal Wounds, folks. You might only get this save ⅓ of the time, but that’s better than not getting any chance to prevent a Mortal Wound from happening! 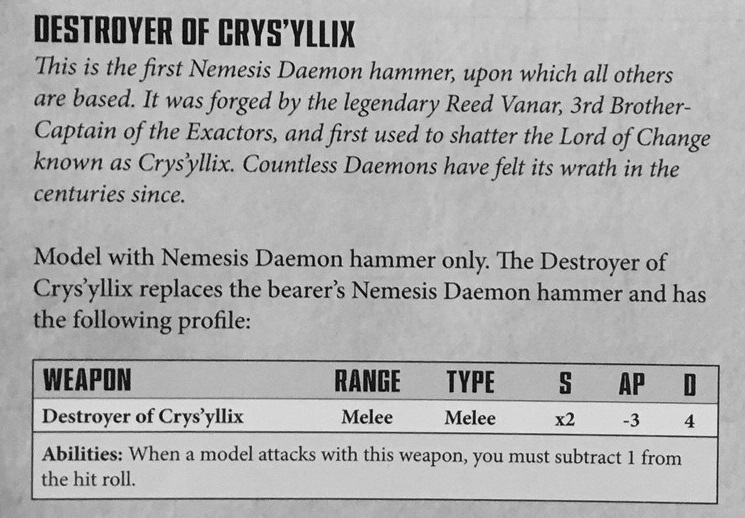 This is the Daemonhammer all other hammers wish they were. What makes this so deadly is that it’s 4 Damage per failed save. OUCH. Toss that on your Grandmaster and watch him go to WORK…he’ll be hitting on 3’s instead of 2’s but he still gets to re-roll 1’s…I’ll take that all day long. I know we said we weren’t looking at outside factors but this relic has the ability to reliably take out a rhino or other tanks in a round of combat. We had to look at that compared to the random D3 damage the Soul Glaive would do – and that’s what tipped it for us. 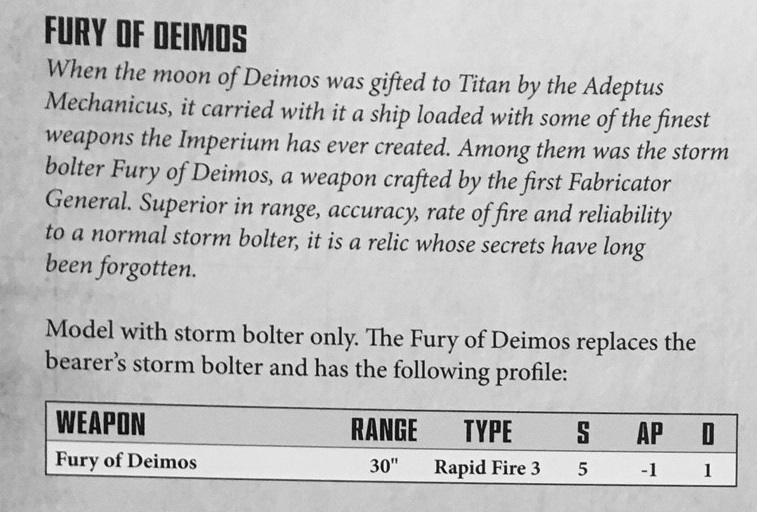 Fury of Deimos gives them back the old S5 ammo they used to have a couple editions back. Let’s just look at the stats: Range 30” Rapid Fire 3 S5 AP -1 D1. It’s basically a Heavy Bolter – except at 15” it’s getting an extra 3 shots! When you’re fighting T4 infantry, it’s basically as good as a Psycannon and you can move and fire with no penalty. On a Grandmaster it’s very deadly… It’s #1 on our list because it’s got range, doesn’t require you to take wounds to trigger, and you can use it against every army and it’s effective. It’s not as fancy as a Daemonhammer or as flashy as the Soul Glaive, but it will get the job done. 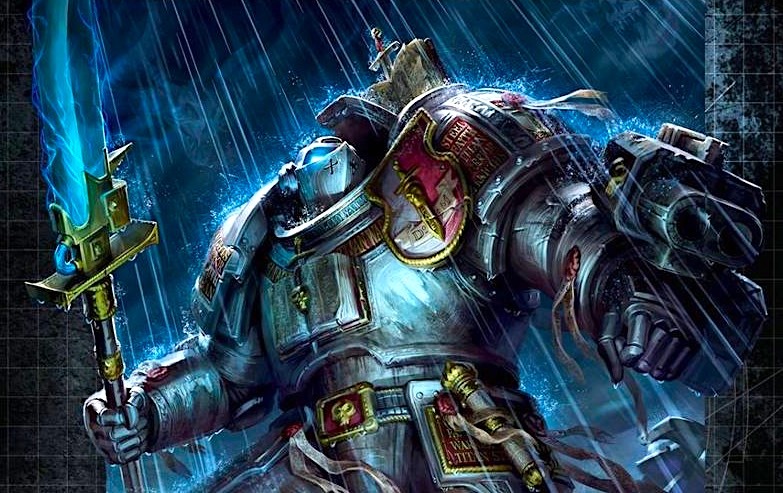 That’s our ranking for the Grey Knight Relics – agree or disagree? Let us know in the comments below!